It's been nearly a year since I last updated this journal. I apologize to anyone that has periodically checked my journal for the past 9 months and has been continuously disappointed. So how can we make our lives purposeful? Well... we should make a difference, stand out, take this opportunity to fulfill our dreams. If you want to quit your job... do it... if you don't like your current situation: change. We only have one ticket for this journey called life, enjoy every minute. I've been thinking a lot about the people I care about. I want to spend as much time with them as I can. When they are no longer around me, I will regret not spending every minute of my life with them. This bothers me. I wish each minute lasted a lifetime. The thought of time passing, growing older, gaining responsibilities, etc..., scares me to death. What do I do with my life? Any suggestions? Shall I focus all my time on the rat-race towards gaining happiness through a large bank account? I probably will do just that... However, I want to make a difference. I don't want to be remembered in the same way everyone else is remembered. I don't want to spend my life pursuing happiness through conventional means. I want to help people at the same time. The ancient Egyptians were genius. They knew that their life would be fulfilled only if their name was going to be remembered. They knew that they had to make a difference to stand out. They understood the meaning of their individual lives better than we do now. They truly understood life's passing nature and thus stressed having their names remembered so that they could live on into the future (in spirit if not in body). If you are confused on why I believe this, e-mail me. Have class at 10 am... it is 4.20 am... I am going to sleep. Happiness... Is a person who isn't so intellectually sound, who does not have many complex thoughts, who does not analyze his surroundings, more "happy" than one who is constantly in thought and analysis? Is he more happy because his lack of attention towards the smaller details of life restrains him from discovering more of life's faults? I guess it's plausible... But I do not think that makes him happier... I think that just keeps him content. I would agree that the 'stupider' individual would be more content with the on goings of his life, through thick and thin, than one who is constantly discovering his/her life's flaws and discrepancies. But... In regards to happiness... Does a less intellectually sound individual experience happiness more often than one who is extremely active intellectually? I think happiness would be longer lived if one is not always nailed on 'reality'. I think one who is constantly in thought is also constantly aware of his surroundings... i.e. constantly aware of reality, responsibilities, worrisome thoughts, etc... I can see how happiness would be longer lived in one who is less aware, but to what extent would that happiness be relished? This is a question that I don't think I should venture to answer. Also, it seems as though one who is more capable intellectualy should be more capable of pursuing happiness in the long run. Right? Well... I guess. But how long is the happiness relished once it has been achieved? Is a successful CEO more happy than a lumber-jack? The movie office-space presents a pretty good example. One phrase that I fully agree with is "Ignorance is bliss." In a modern, urban environment, only a 6-inch turkey subway made with low-carb bread will suffice. I think an ignorant person is generally happier than the latter. This statement seems less faulty than alleging that an intellectual, always in thought, is less happy than one who is never in thought. Today I had to run many errands and then catch a flight to Tucson, Arizona... There is a huge Jewelry Exhibition here and my dad definitely needs my assistance. In a few words: The exhibition is 10 days of pure hustling. With all things, success is directly proportional to a combination of one's efforts & abilities. 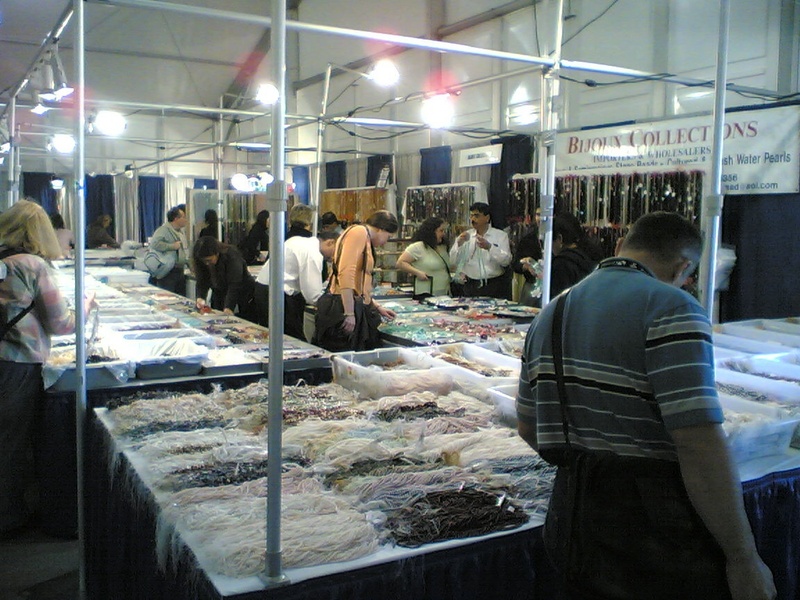 In sales, especially a exhibition like this one, you need to be a pure hustler. Out here, at any given moment, for every one salesperson, there are five customers... and you can't let even one customer slip away: With a sale, you are selling brand equity and gaining customer loyalty - which is priceless :) . Our company picks up many long-term (& high volume) clients at this show. On the plane ride over here I started Chapter 1 of 'The Intelligent Investor' by Benjamin Graham... Recommended to me by Moises Eilemberg, a brilliant individual that I have been interning for... Flipping through the pages I realized how ignorant I am when it comes to financial markets... I also realized how much harder I should be working to achieve my career goals. I need to secure a solid position at an established banking firm and initiate relationships with mentors and 'helping hand' figures. I want to go into investment banking... not because I love the way financial models look... but I like the idea of working hard, having loads of pressure, and high expectations... also, I like the idea of i-bankers' compensation. Anyway... I'm signing off for the night... Have to wake up early and get pumped for a long day of work. Goodnight. Today I woke up and pondered our purpose here. Is it simply to prolong the existence of our race? If so, our purpose is quite a bit more complicated than to just reproduce. We have to look after the wellbeing of our fellow-people (could this be why helping other people brings us such a great feeling of accomplisment?). We have to look after the essentials that support our existence. We have responsibilities that the modern world forces us to overlook. Another random thought: stretching from the "big bang" theory. Suppose the big bang was the spawn of this "Universe." Suppose all that exists now is a result of the big bang. Suppose initially there existed only one or two basic elements. Helium, Hydrogen, whichever is more pure & basic (has a longer life-span). The basic element has a far more superior life-span than other elements on our periodic table. All other elements eventually break down into the basic element, the purest form, by radiation, etc... Would one agree that the purest element is also the purest life-form, extending from the theory that our purpose is to prolong the life of our species? If the purpose of all life is to prolong its existence, wouldn't the purest element be the one that is indestructible and of the purest form? If so, from the big bang onwards, the multitude of elements created were less pure than what they were created from. The multitude of elements we see/have now are less pure than what they all spawned from. From element, to molecule, to carbon chain, to microbe, to bacteria, to cell, to organism, to species, - could this be a depreciation of purity? Are we a less superior life form than a basic molecule, than a basic element, than the purest element? Suppose we are... Since all other elements other than the purest element eventually break down into the purest element by radiation, anti-matter, explosion... Is the complexity of life now destined for destruction? After all, as a species, we have a much lower life span than an element... Will the progression of our species lead to lower life spans, will we destruct oureselves? In time, will the big bang re-enact? note: as far as reproduction... it seems as though our inclination to reproduce is the pleasure derived from the act. At least from the male's perspective, the want to plant "the seed" is directly related to the pleasure. Many have implied that the pleasure derived from sexual conduct is possibly the greatest physical pleasure possible. If this is so, we are then programmed to reproduce. Reproducing is more important than consumption of food/nutrients as the pleasure of a good meal does not surpass the pleasure of reproduction. Sustaining our individual lives are less important than the survival of our species. Also... Going back to the thought that our main purpose in life is to prolong the existence of our species, wouldn't asexuality be the most efficient act of reproduction? having two sexes only complicates the situation by making it a more tedious reproductive process. Could this be part of that "depreciaton" of purity? - Bacteria are probably much much more efficient and prolonging their species than any mammal species would be. Anyway, this is probably going nowhere. Just a rambling thought. This is what happens when someone lays in bed Saturday morning and thinks about random things. The above gives examples of why we want to reproduce, why it seems like life's purpose is to reproduce, etc... I didn't emphasize the fact that reproduction = survival. The main purpose of life is to survive. Why reproduce? Reproducing = evolution. Reproducing allows later stages in the evolution process to take place... Each reproduction is like a later, updated version of life that is more suited for environmental changes (survival of the fittest). Take the human race for example, if we just stopped reproducing at the homo-erectus stage, and the life span of a homo-erectus was 50000000 years, the human race wouldn't have ever reached this stage of technological/intellectual advancement (might have been for the better? EPA would say so). So are we just going to keep reproducing into more effecieint life-forms? Will we just keep advancing/evolving until we are entirely self-sufficient and can cope with all threats to life? Maybe technology will slow our biological evolution since it kind of is acting as a substitute... Or maybe technology was the answer, since technology is the result of a more complex mind, and a more complex mind is a result of evolution. Thus, from a biological perspective, a more complex mind = more capablities for self-protection as far as choices, options, and development. We will probably continue to evolve, however evolution will just continue to fine tune our intellectual abilities allowing us to continue advancing technologically.